I saw this in a book store a few weeks ago, and when I went back I was drawn to it again and had to purchase it. 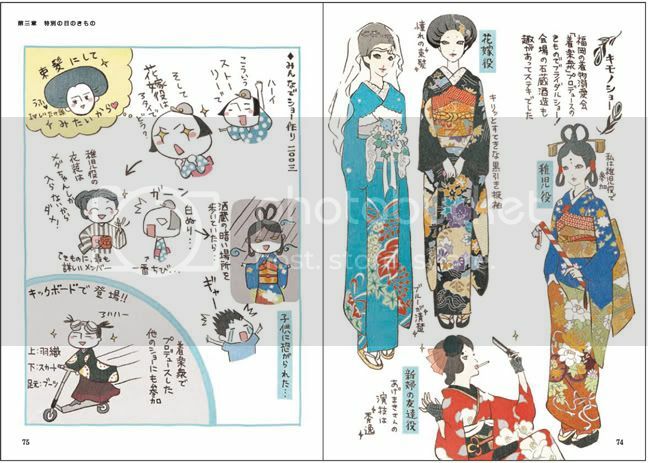 It is a manga essay type book featuring lots of cords and ideas, and the kimono bancho (boss) does such lovely illustrations it is very accessible. 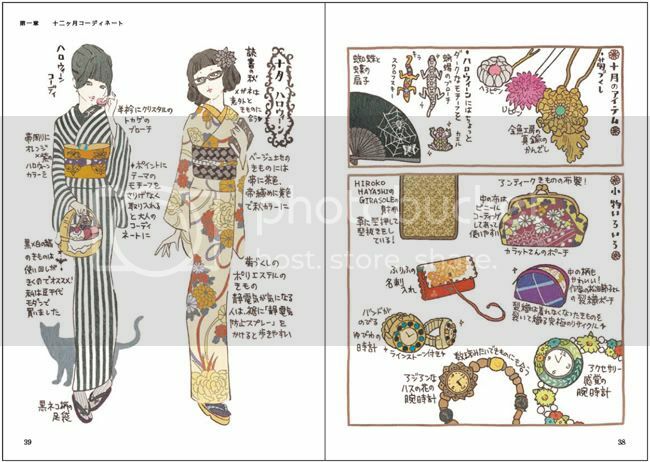 She has connections to Mamechiyo (who positively reviewed this book) so the cords are very modern. I love her outfits! Each month has two cords with ideas for adding seasonal details to outfits and general ideas for komono. 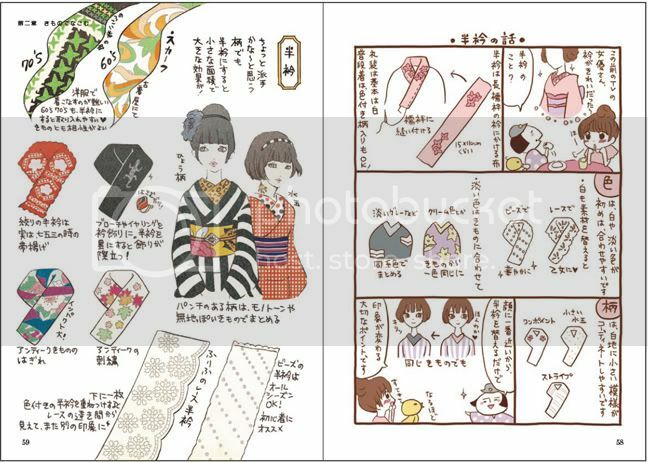 She also has great ideas for tieing outfits into seasonal events in Japan like Setsubun and Valentines day (which I am definitely going to be trying). There are a few simple hairstyling ideas too for different occasions. Her kimono philosophy revolves around keeping kimono and obi to non-seasonal geometric patterns so you are able to get the most use out of them, and getting seasonal details in things like han-eri, obidome, hair accessories etc, and she has many ideas for hand making them, for example painting designs onto han-eri with acrylic paints. 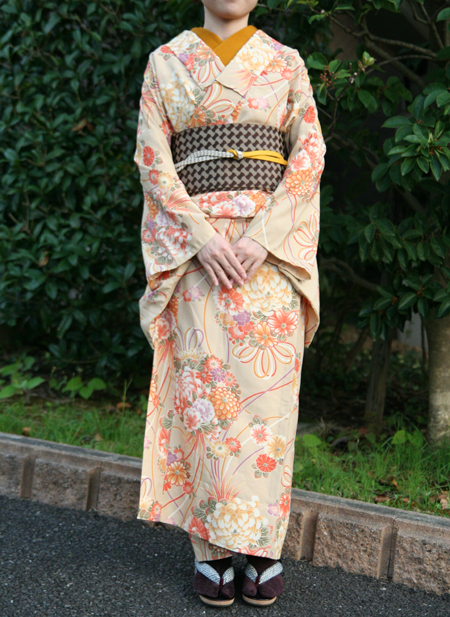 Here she talks about kimono outfits for shows and her wedding. Chapter 4: Lets make Komono! 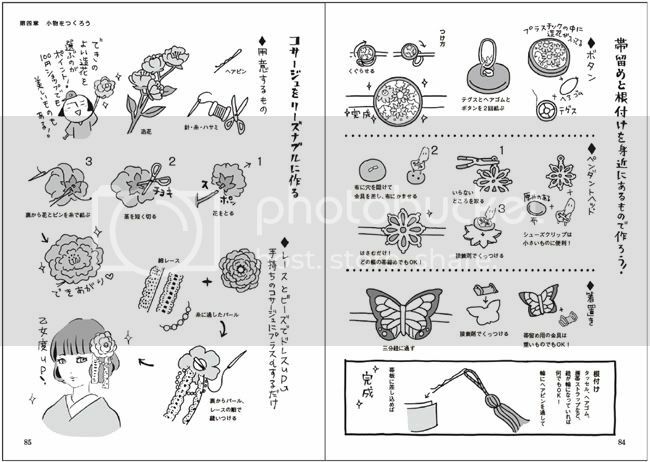 I really like this section, it has alot of simple crafty ideas for komono. I`m sure for more crafty people have been doing these kind of things already but for beginner crafty people (or people like me who have WIP syndrome) lots of quick things that can really personalize an outfit. It`s all in the details! 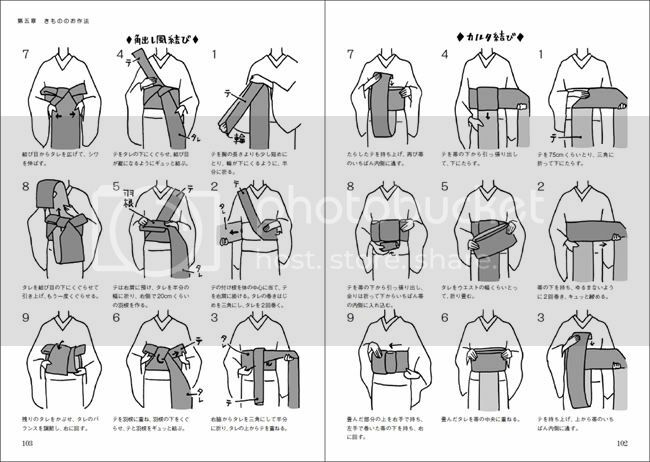 A short section on basic kitsuke and obi masubi with some practical hints and tips for everyday wear. This book is going to be a staple for sure and I`m definitely a fan of Ms. Matsuda from now. I have already lent it out to a friend who loved the ideas too. -those wanting in depth kitsuke. This is so on my TO BUY list now! In fact, you might as well add "For Lyuba" in the "Recommended For" field, because I can say that I've been following the same philosophy. Although I love the drawings, I would have preferred them to be photos instead because with drawings there are unlimited possibilities. I want to see the ACTUAL thing she has to work with. Looks very cute, but I agree with Lyuba - I'd have loved to see some photos, too! I do like the suggestion of buying geometric and then adding in seasonality. Such a practical look on things; I like it. Does your signature comply with the rules? Check this thread for details. Ah yes some photos would have been nice, illustrations is a bit of a cheat really! 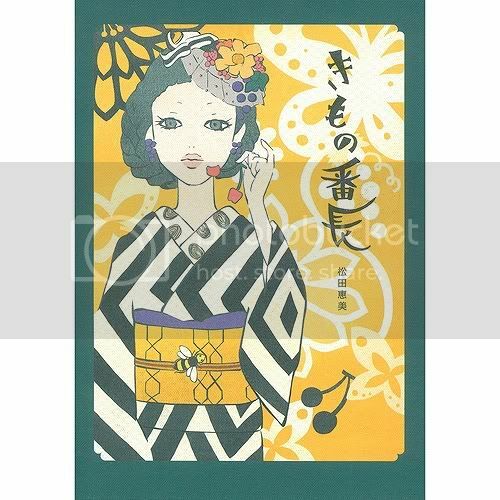 I did find some pictures of her hand painted han-eri and yukata on her site. 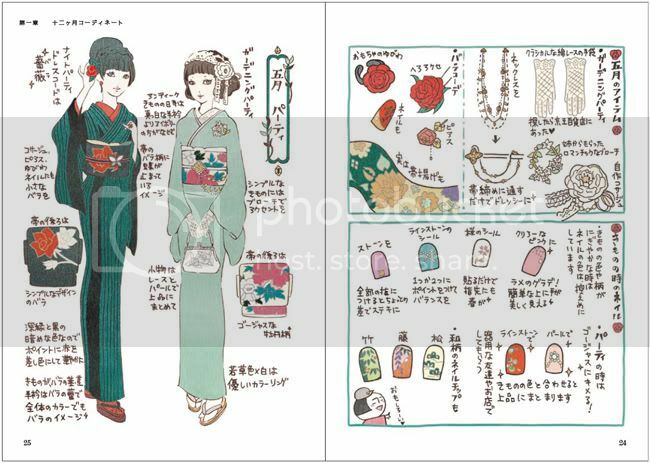 I love seeing that she has one of the kimono she uses pretty often in the book! Must mean she's done or at least tried to do a lot of those coordination. I wish I could find out shipping on Amazon.co.jp without having to enter my cc number, haha. I found some photos of the coordinations! Thanks for the review, isshi! Such a cute book. And OMG I want a Beetlejuice kimono even more now. 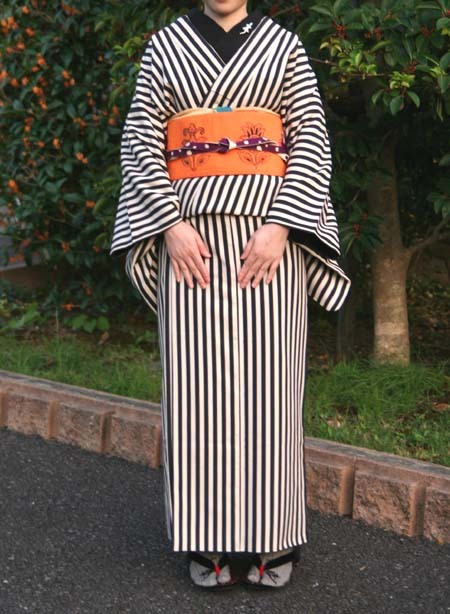 I knowwwwww...i want a black and white striped komon SO BAD but they're so difficult to find and $$$$. Even plain black and white striped fabric is almost impossible to find unless it's tiny pin-stripes, or giant 4-inch stripes for home decor. Megumi Matsuda is on instagram as @kimonobancho and has recently released a series of kimono emoji/stickers somewhere online. 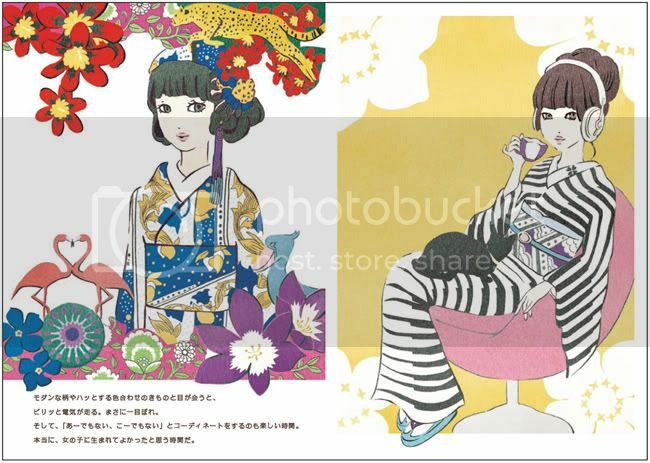 She frequently posts illustration snippets and I believe she has also been very involved in promoting Kimono no hi (annual kimono day) recently.